As many as 500 “especially violent” Argentine football fans could be in Madrid for Sunday’s rearranged Copa Libertadores second leg between River Plate and Boca Juniors, Spanish officials have warned. The game, which is the decisive leg of the biggest tie in South American club football, has been moved from Argentina following fan violence which forced the postponement of the original meeting in November. The match will be held at Real Madrid’s 80,000-seater Santiago Bernabeu stadium, and Spanish police will be out in force to ensure there are no unsavoury scenes to distract from the football this time. Around 4,000 security personnel will be used to keep order amid the potential threat from 400-500 “especially violent” fans who have made their way to Spain for the game, AP quotes the local authorities as saying. 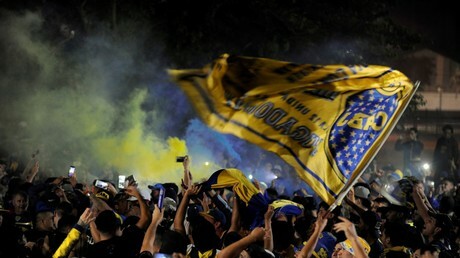 Earlier this week an alleged leading member of Boca Juniors Ultras was deported on arrival to Spain, while a River Plate fan was reportedly ordered to leave the country on Friday. “The national police is working closely with the Argentine police,” said Jose Manuel Rodriguez Uribes, according to AP. Rival fans are already massing in the Spanish capital for the game, known as the Superclasico. The security presence of 4,000 personnel is said to be twice the size of that usually used for El Clasico matches between Real Madrid and fierce Spanish rivals Barcelona. Both River Plate and Boca have been allocated 25,000 tickets for the game, but only 5,000 of which are available for sale in Argentina. The fans will be seated at separate ends of the stadium, while any title celebrations will be directed to different parts of the city, depending on the victors. River fans will be directed to the Plaza de Colon and Boca supporters to the Plaza de Cibeles, AP reports. Neither club is happy at the change in venue, with Boca demanding that they be crowned champions outright over the bus attack that initially caused the postponement of the second leg, while River have bemoaned the loss of home advantage. Boca filed an appeal with CONMEBOL and then the Court of Arbitration for Sport, although the latter body on Saturday rejected Boca’s latest bid, meaning the match is set to go ahead. Court of Arbitration for Sport rejects Boca Juniors’ urgent bid for #CopaLibertadoresFinal 2nd leg to be suspended as it pursues legal action trying to get River Plate disqualified over the Buenos Aires violence. The tie is finely poise at 2-2 following the first leg draw on November 11 at Boca’s La Bombonera stadium. Published on Sat, 08 Dec 2018 13:30:40 GMT, © All rights reserved by the publisher.